Leica has introduced the D-Lux 6, a compact camera with a wide maximum aperture of f/1.4, at Photokina 2012. 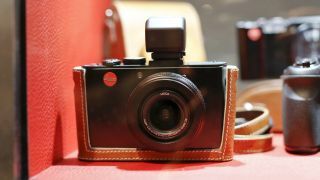 The camera is basically Leica's rebadged version of the Panasonic LX7, which was launched earlier in the month, and with whom Leica has a working partnership. A newly developed 1/1.7-inch CMOS sensor is joined by a wide range of features, including fully automatic mode, manual setting modes and Full HD video recording. The Leica D-Lux 6 was announced at Photokina 2012, alongside the Leica V-Lux 4, Leica M and Leica M-E, Leica S and new lenses. The lens of the Leica D-Lux 6 is a Leica DC-Vario-Summilux 4.7-17.7mm optic, which offers 24-90mm in 35mm equivalent terms. The maximum aperture of the lens, at the wide end, is f/1.4, rising to just f/2.3 at the telephoto end. A 10 million pixel sensor is joined by a new image processor which facilitates high ISO shooting of up to ISO 12,800. A high resolution, 3-inch, 920,000 pixel screen is also available on the back of the camera. Full HD video recording is available. Accessories can be mounted on to the camera via the hotshoe. Available extras include an electronic viewfinder and a compact flash unit. A selection of cases and bags specially designed for the camera will also be on sale. The Leica D-Lux 6 price is £600 (around $975), with a release date of November 2012. Supplied with the D-Lux 6 is a copy of Lightroom 4, which can be used for managing and editing images.